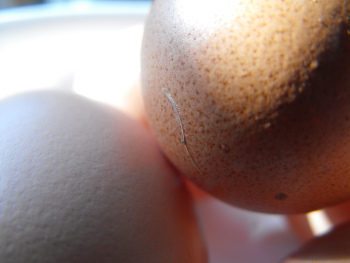 If you have chickens or get really fresh eggs, you will be familiar with the first problem. THEY WON'T PEEL! If you want to make deviled eggs and boil them, removing the shell takes away big chunks of the egg white. Not very pretty on the potluck table. Simple solution. Chill the eggs before peeling, either in ice water or by leaving them in the refrigerator at least three hours after bringing them to room temperature in cold water. There is a bubble of air on the wide end of the egg. Crack it there and remove the peel and the membrane under the peel. It will now peel like a store-bought egg. Or you could have a carton in the back of the fridge that you use for "boiling" eggs. Let those age for a few weeks and the egg will peel like you bought it from the store. I do tend to have older eggs around during seasons when the hens lay fast, but it seems like during the winter we eat them as fast as we can get them! I haven't actually tried the cooling approach to peeling hard-boiled eggs, but I'm looking forward to it --- right now, I've gravitated more toward poached and fried just because of the peeling problem. I got my chicks on the end of June last year and they've laid prolifically thru the winter months. So timing might increase winter production. Our little girls lay great, we just eat a lot of eggs. In winter, they drop to maybe one egg per hen every other day, and with only six layers we sometimes get low!